Distance from road: 2.50 miles. Hot spring water show ups under the gravel on the eastern shore of Paulina Lake. 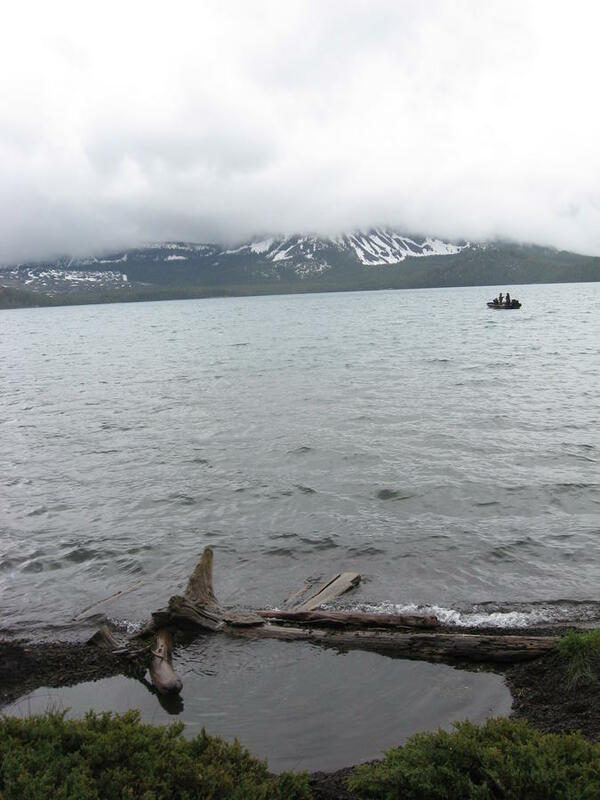 The hot water bubbles up from deep and flows on top of the lakes water table because of the temperature difference. 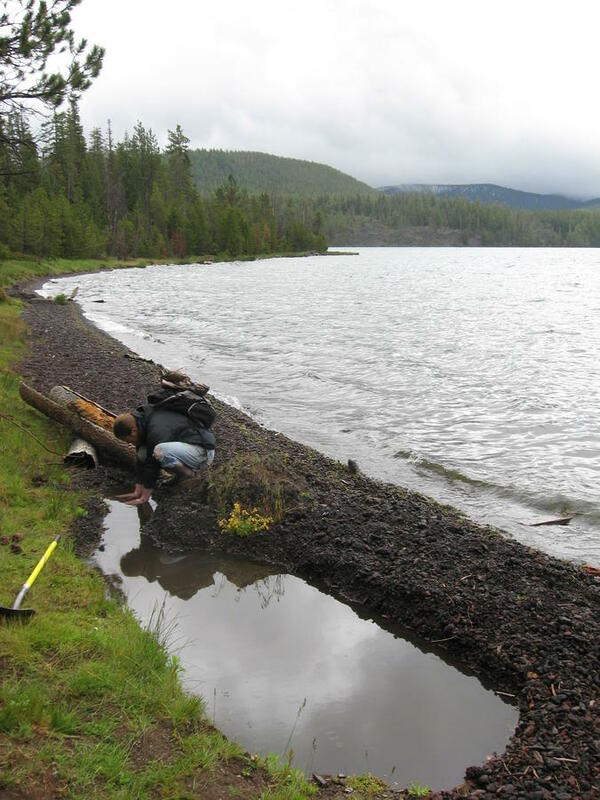 In other words the water that is flowing into the lake in this area has a layer of hot water riding above the cold water at temps from 95 to 130 degrees F. Therefore you can dig a hole on the gravel shore next to the lake and see it fill with hot water from the eastern side of the hole. A shovel is always useful here if you want to dig your own soaking pool or work on an established pool. 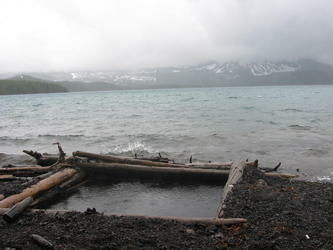 The established soaking pools are all built on a gravel beach where the walls of the pools are supported by wooden logs. One pool is larger and well built and offers the best soak. Don't burn your feet trying to get to one because they could be hot depending on the lake water level and wind conditions. When the water level is low there could be a few feet between the logs and the lakes edge leaving the pools high and dry needing some cold water added with a bucket to make them soakable. 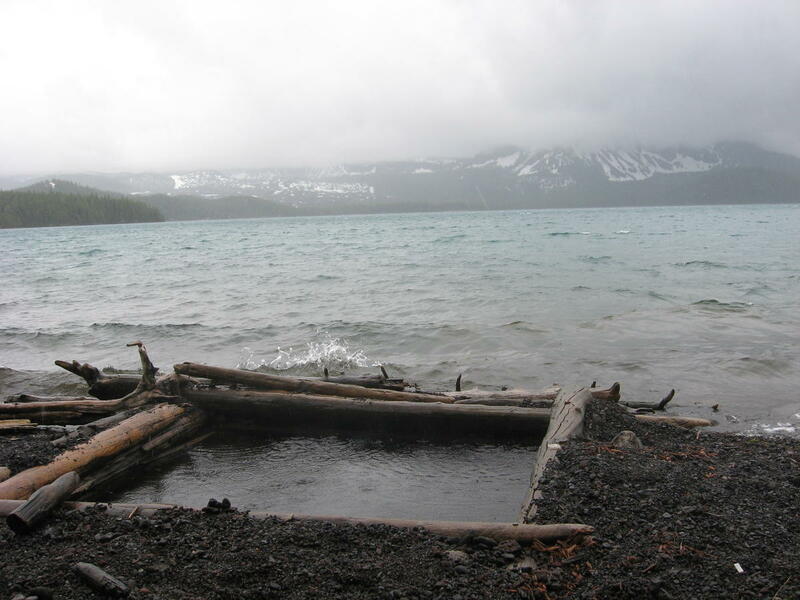 If the water level is high the tubs are directly on the waters edge with cold water seeping through the logs and splashing over the edge keeping the water temperature below 100 degrees F.
These pools are popular for the area and much better known than the East Lake Hot Springs. 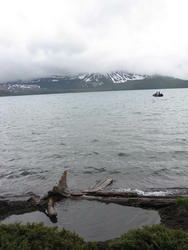 Paulina Lake is also very popular with fishers and boaters you will probably be within eyesight of someone. People have been soaking in this area for many years but the main soaking area has changed. We were told that 10 to 15 years ago there was a pool built in the marshy area just south of the gravel beach. If you look there are a few pool like holes in the marshy area and one is still lined with logs. The pools may be there but the hot water is not, it moved slightly north to the little gravel beach where the pools are now. Submitted by muhammad27 on Fri, 2016-01-08 01:50. Submitted by muhammad27 on Fri, 2016-01-08 01:49. Submitted by joshuababs (not verified) on Wed, 2014-12-10 07:16. Submitted by Anonymous (not verified) on Mon, 2014-09-29 18:46. I will share with my friends the same reference. There is alot of good info in this article. Submitted by Jake (not verified) on Wed, 2013-06-19 21:03. 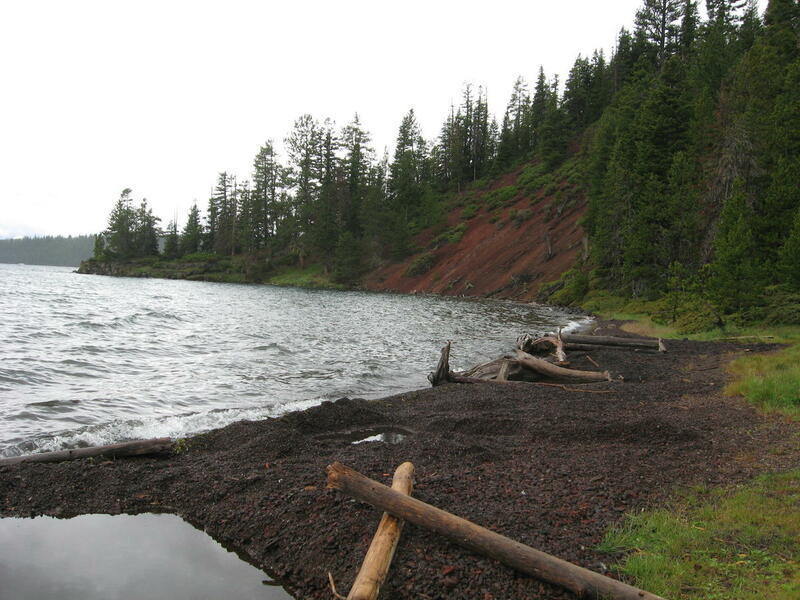 My wife and I camped at Little Crater Campground from 6/16/13 until 6/19/13. The campground was reasonably nice, the restrooms were pretty clean and water was available throughout. The wind coming off the lake was pretty brutal; I would advise either bringing a camper or starting your stay on a non-peak day so you can snag a spot a bit farther from the lake for extra wind protection. Even with all of that, bringing a tarp or two for a windbreak would be wise. The hot springs were easy to find, located about a mile from the trailhead at the end of the campground. There are hot springs all along the shore starting from the interlake flow, even in the marsh, contrary to the description above, but the gravel pools are nice enough that digging a pool in the marsh is unnecessary. The water level was high enough that most of the pools were warm rather than hot, but one pool was hot enough that we felt the need to add some lake water to make it comfortable. This morning we woke up to water in the tent due to sideways rain; setting up camp with the wind in mind is a must.